You Can Shop AND Do Good While You Make Your Holiday Purchases! Did you know you can support active transportation while you shop? It’s something you have to do anyway, so make every pantry staple, splurge or special occasion purchase count. 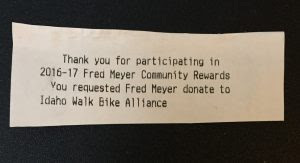 Link your Fred Meyer rewards card to Idaho Walk Bike Alliance (#91348), scan it every time you pay, and we’ll receive donations from their Community Rewards program, at no extra cost to you. It’s easy to do, so sign up to link your card today! Visit Fred Meyer and sign in or register for an account at top right. Scroll down and click Link your Rewards Card Now. Enter Idaho Walk Bike Alliance or 91348. Select the bubble next to our name and click the Enroll tab. Start shopping to benefit the walking and biking movement! Shop online at AmazonSmile, choose Idaho Walk Bike Alliance as your charity of choice, and 0.5% of each qualified purchase will be donated to us,with no extra fees for you. Sign up now! 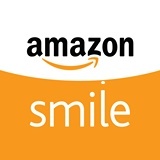 Visit AmazonSmile and sign in with your existing Amazon.com account info or create an account. Scroll down to pick your own charitable organization instead of choosing one of Amazon’s spotlight charities. Enter Idaho Walk Bike Alliance in the search box and hit the Search button. Click on the Select button next to our name. Check that you understand you always need to shop via smile.amazon.com to support Idaho Walk Bike Alliance. Start ordering online to support active transportation!